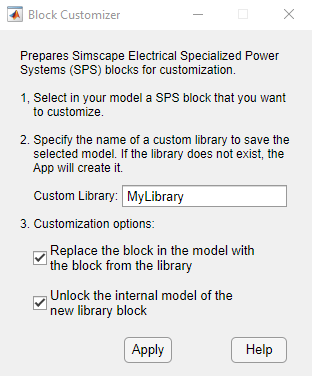 Simscape Electrical Specialized Power Systems blocks you customize cannot have broken or inactive library links. In other words, you cannot disable or break the library link of a block and start customizing the block directly in your model. If you want to modify a block, you make a copy of the block in a custom library, break the block link to the product library, and start doing your modifications in the custom library. The function power_customize automates these steps and helps you to prepare a Simscape Electrical Specialized Power Systems block for customization. You can call the function from the command line with power_customize, or you can click Customize SPS blocks in the Tools tab of the Powergui block to open the dialog box. In the typical workflow, you open the power_customize dialog box, select the block you want to customize in a model, specify the name of a custom library to save the block in, and apply your changes. Then you customize the block in your library. The dialog box also has the option to replace the block in your model with a library link to the new custom block. Specify the name of a custom library to save the selected block to. If the specified library does not exist, power_customize creates it. The block is copied to the library and the name appended with the text (custom) when you apply the changes. The library opens, and you can then customize the block in your library. The default value is MyLibrary. Replace the selected block in your model with a copy of the block (i.e., a library link) from the specified library. When you apply your changes, the function replaces the block in your model with the library link to the new custom block. When power_customize creates the library block and the link in the model, it appends the block name with the text (custom). This parameter is selected by default. Simscape Electrical Specialized Power Systems blocks use internal functions that control the mask behavior and the internal Simulink® model. 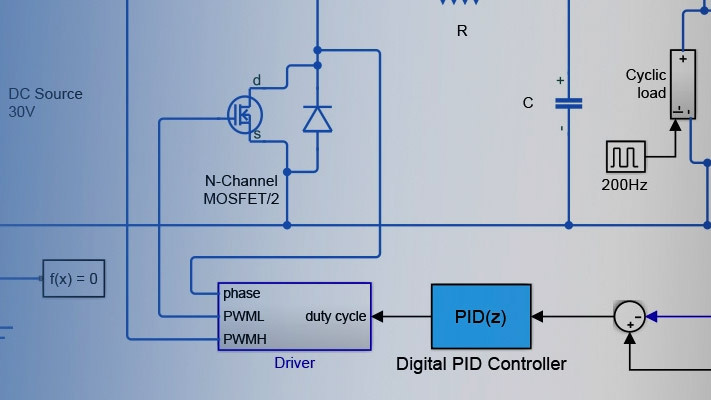 For example, the function replaces the internal Simulink model of a Synchronous Machine block with a discrete model when the Simulation type parameter of the Powergui is set to Discrete or to a phasor model when set to Phasor. Select Unlock the internal model of the block to enable customizing of the internal Simulink model of the selected block. The internal model of the block is then no longer controlled by the Powergui Simulation type parameter. If you do not plan to customize the internal Simulink model but instead plan to rework other parts of the block, you can clear this check box. The internal model of the block remains under control of the Simulation type parameter of Powergui. The power_V2G example model, which shows a 24-hour simulation of a vehicle-to-grid system, contains a customized Asynchronous Machine block (under the Load subsystem). The electrical internal model (a phasor model) was optimized to provide faster simulation in phasor mode. This custom block and the V2Glib custom library were prepared for customization using power_customize.